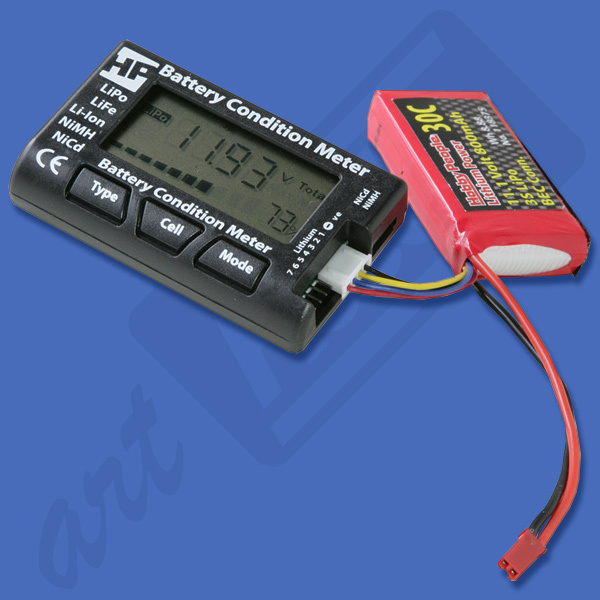 This is a Battery Condition Meter w/Cell-Checker and Li-Po Balancer. The Battery Condition Meter eliminates the guess work about your battery’s current condition. Compatible with Lithium, Ni-Cd and Ni-MH cells, the Battery Condition Meter is able to check the Total Voltage (Lithium, Ni-Cd and Ni-MH), Remaining Capacity, Individual Cell Voltage, Individual Cell Remaining Capacity, Lowest Cell Voltage, Highest Cell Voltage and Voltage Difference Between Highest and Lowest Cells (Lithium Only). In addition, the Battery Condition Meter can balance your Lithium battery by slowly discharging the higher voltage cells. Use it in your workshop or out at the track or the field. 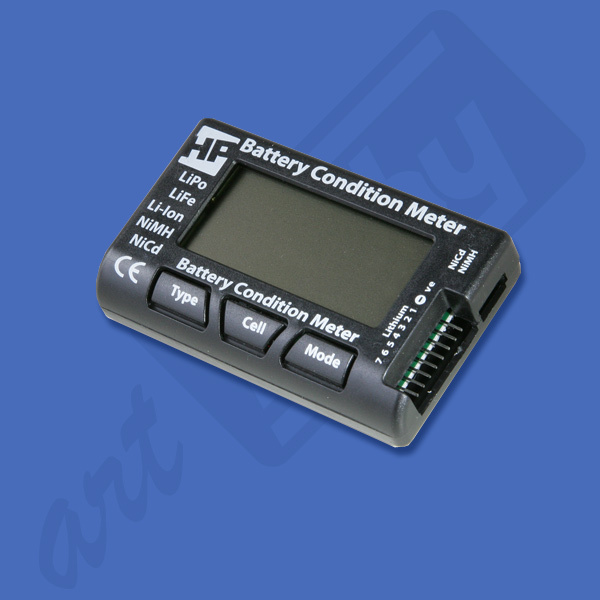 The Battery Condition Meter is small, lightweight and easy to use. Simply plug your battery in and view the condition of your battery! The Battery Condition Meter will also balance the cells in your pack, slowly and effectively. Ensure ALL of your cells are level all of the time with the balance function. Typically, balancing only takes 10-20 minutes and ensure you have a balanced pack! Use it as a voltmeter for your Ni-MH Packs too. Connect up the output lead of your typical Ni-MH battery and the Capacity Meter will tell you pack voltage. Know the condition of your pack before you use it! Using other packs that do not have the XH balance connector? Your battery's balance plug will not work? To make it work use the Universal Balance Board. 40 g / 1.4 oz. 84x50x17 mm / 3.15x1.96x0.69 in.